This succulent pork roast can be made with a rib roast (pictured) or center cut bone-in pork loin roast. Serve it with baked or mashed potatoes and a corn dish or your favorite side dish. This roast is a fabulous choice for a holiday meal or Sunday dinner. Prepared with only three ingredients plus mixed herbs and salt and pepper, it's as easy as it is impressive. Use a standard meat thermometer, oven temperature probe, or an instant-read thermometer to test the roast for doneness. According to the USDA, the minimum safe temperature for pork is 145 F.
This recipe is easy to customize. Try the suggested herbs, or use what you have on hand. Some other good choices for pork include tarragon, parsley, coriander, and cumin. Cover and refrigerate for 2 to 4 hours. Serve with fried apples or applesauce, potatoes or sweet potatoes, and spinach, squash, or a salad. Replace the fresh herbs with about 1 1/2 teaspoons of dried herbs. A rack is used to keep the roast out of its drippings as it cooks. If you don't have a wire rack, scatter fresh carrots and celery sticks in the bottom of the foil-lined pan. You can also crumple a few sheets of foil and use them to make a rack. Place the roast on the vegetables or crumpled foil. The minimum safe temperature for pork (USDA guidelines) is 145 F (62.8 C). 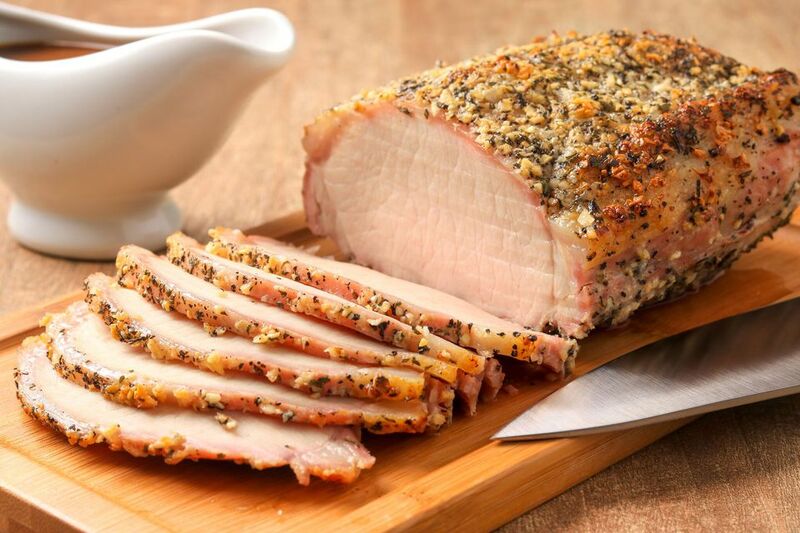 The Canadian government recommends a minimum temperature of 160 F (71 C) for pork.